They’re Here!!!! The New FreezEasy Meal Plans are Here…With a Special Introductory Offer! About 2 weeks ago, my dishwasher broke…actually, it started leaking, damaged the floors behind the wall where it sits as well as the cabinets around it. Then it shorted out and broke. (See some of the damage here on Instagram.) Currently my floors are ripped up, and the sink section of my kitchen cabinets will have to be ripped out and replaced. This little “remodel” (except it’s not at all a remodel…it’s really a nuisance!!!) will likely cause us to continue to be without dishwasher for another couple weeks. 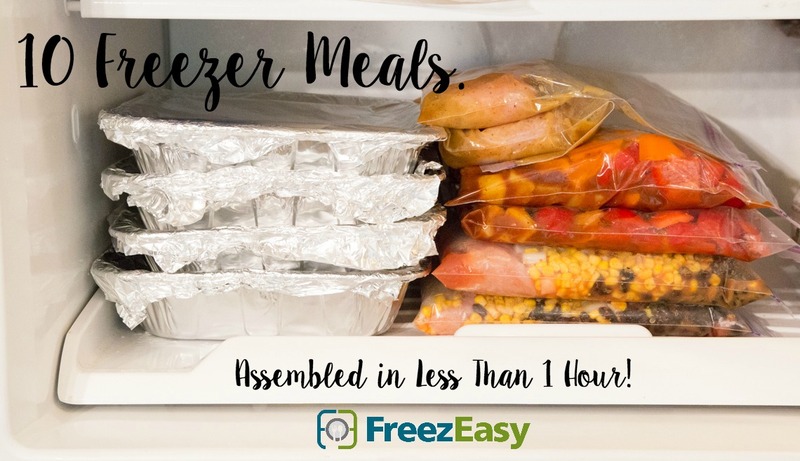 All this to say…freezer meals come in handy when you least expect it…both on crazy busy weeknights, and during times of added stress or transition like we are experiencing at the moment! Even when our life isn’t running as smoothly as I’d like and our kitchen isn’t about to get torn up, I still use and rely on freezer meals for those crazy busy weeknights…when we have Scouts and basketball practice on the same night – so we end up being pulled in multiple directions. Or when my husband works a “later than usual” work shift, throwing off our afternoon and evening routine. Or when I get stuck at the pediatricians office at 5 pm and know I won’t have time to fix dinner (but my husband could warm up a freezer meal!). I am a firm believer in the power of freezer meals and freezer cooking…I’ve been doing it for years and freezer meals have saved my tail and kept me out of the drive thru lane hundreds of times. The freezer cooking meal plans that we have available in the store have by far been the most popular of them all, and because of that I’ve decided to create this dedicated new website for freezer cooking meal plans! NOW...It’s time for you to take back control in your kitchen and stop feeling overwhelmed on busy weeknights…or weekends when you don’t feel like cooking but can’t afford another dinner out. Let FreezEasy come to your rescue! P.S. We have 2 brand new meal plans available for you in the FreezEasy store…and will be releasing 3 more later this week! And even more next week! Wahooooo! P.P.S. 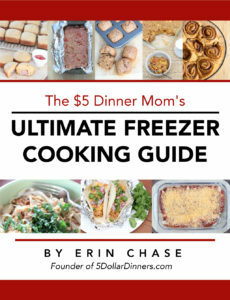 The first 500 FreezEasy customers will get a copy of my Ultimate Freezer Cooking Guide E-Book ($10 value!) – Get this AMAZING deal now and be on your way to becoming a freezer cooking pro!!! I just ordered two meal plans. Cannot wait to get started. Maybe even give one to friends whose mom is having surgery tomorrow and I’ve already told them I’d bring a meal. Will see how it goes. Thanks, Erin, for your help. Not done meals like this before but have prepped meats and sauces together for later to add to things for meals. 3 adults at our house and all working makes it a busy life. Great idea! I’ve done freezer cooking in the sense that I’ve doubled whatever I am cooking and froze half. Nothing better than having a meal ready to go, especially on busy days… and keeping us out of the drive thru lane is a huge bonus. I am interested in trying these.